This normally could be a bad start relay and over load for the compressor, dirty condenser coils need cleaning, condenser fan motor is not running or the compressor itself. To check the compressor properly you should test it with an amp meter, each compressor is rated in running amps ( see model/serial tag or the sticker on the compressor )...if the compressor is drawing too much current, this may be why it is shutting off. Check the model tag for proper amp rating. Some relays will be easy to notice the broken with them, they may be burnt. Example one, example two, example three. Some of these relays can be removed and give them a little shake, and if they rattle around inside the relay is likely bad. Compressors can also seize and click on and off or one of the electrical windings inside the compressor could have opened up. 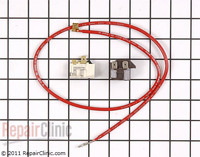 You can use a test cord to help check the compressor and this also will help with the amp test. 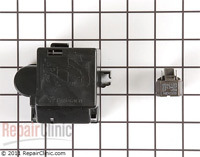 If the compressor checks ok and you want to install a replacement start relay. You will need to find out which winding is which. You will need an ohm meter to determine the windings. First check to see if you have windings in the compressor. Then check to see if they are grounded. If the compressor has windings and they are not grounded, you can find which winding is which. 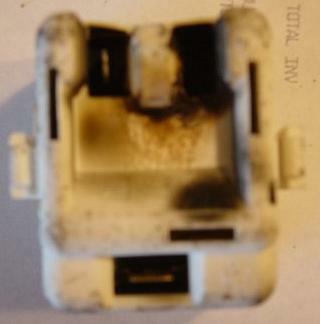 Check for grounded windings by reading from each terminal to a good ground on the cabinet. Read from the top terminal to the lower left terminal. Read from the top terminal to the lower right terminal. Read from the lower left terminal to the lower right terminal. Write down the resistance of each reading as you go. 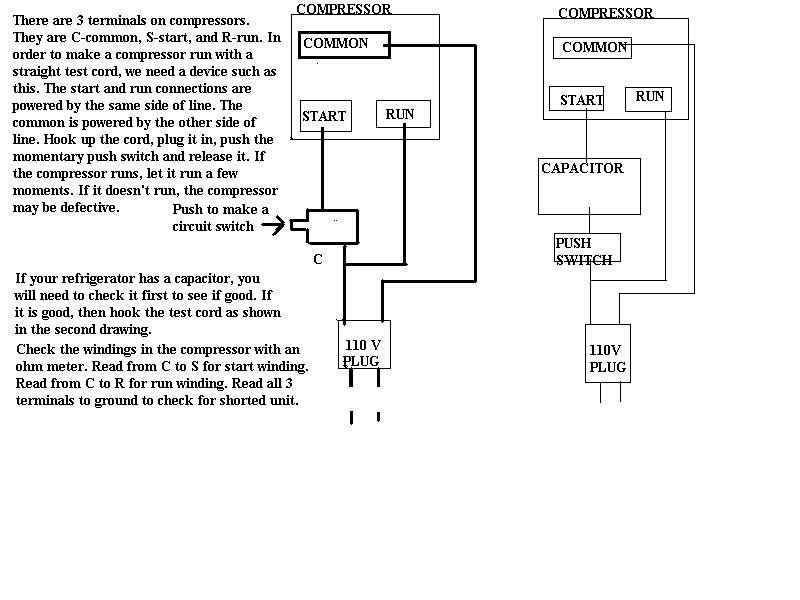 The highest reading you get will be the run and start winding of the compressor in series with each other. The other terminal left will be the common terminal. Read from the common terminal to each of the other terminals. The terminal with the lower resistance will be the run winding. The higher resistance the start winding. 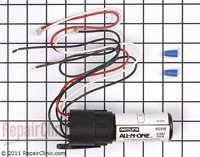 Using the original style relay is always preferred, but using a general replacement can "get you by" if needed. Meter checking a refrigerator start relay and over load help linked here. A few things to check for is - power at the outlet, check for 120 volts. If the light inside the fridge works, the defrost timer, cold control and possibly the wiring are the most common things that can make a fridge sit there and be "dead", not running. 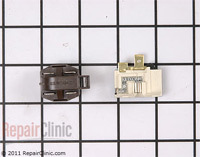 The defrost timer might be stuck in defrost, turn the timer screw to advance the timer and if the fridge comes back on, replace the defrost timer. You can join the wires together to by-pass the cold control for a test, if the fridge comes on, replace the cold control. Most times this is a bad cold control, but there are other things to check for. Make sure the condenser fan is working and the coils are not covered with dust. A separated heat exchanger ( small capillary tubing soldered to the large suction line ) can separate from one another and make the fridge run too long. - tape tubing back together. 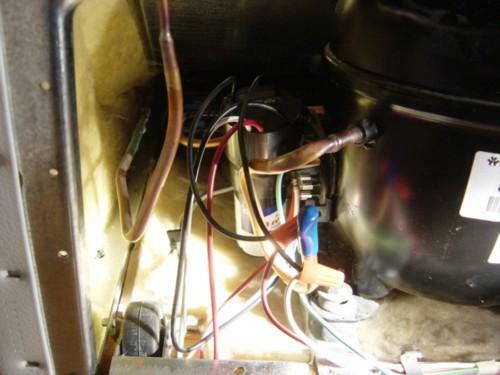 A poor working evaporator fan motor could also make the fridge run too long and freeze - replace the fan motor. 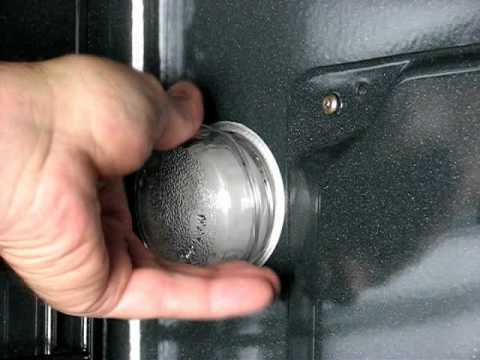 An inefficient compressor or refrigeration system could make the fridge run too long and freeze - have a service tech check this out. A misaligned control settings, make sure the air damper and cold control have not been bumped and are out of normal settings. Stuck open air diffusers or air dampers are becoming more and more common for allowing too much air to be blown into the fresh food section and freezing things. On all frost free fridge's the freezer temp air is blown into the fresh food section, if you have "easy" to freeze items ( eggs, veggies in water, etc ) in front of or under where the freezer temp air comes out, they could freeze - store them in a different spot. Doors not closing properly making the fridge run too long is something else to check for. 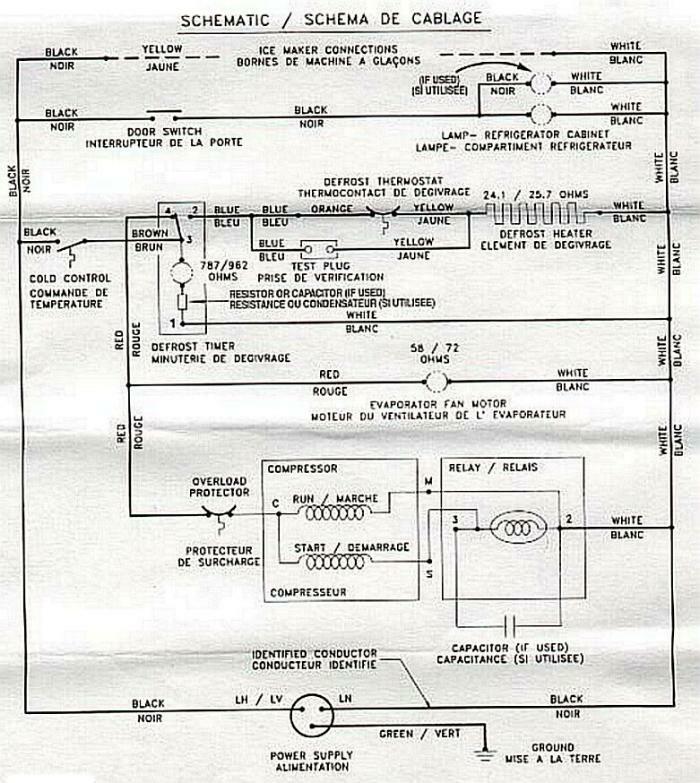 Sorry to say most times this is a faulty compressor. A compressor is a electric motor and pump mounted from springs inside the black dome, if one of these springs stretches or breaks the motor and pump hits the outer casing dome and bangs when it shuts off. Other things to check for, tubing touching one another, something fallen behind the fridge, condenser fan motor blade hitting something, defrost condensing pan out of place. I heard a sizzling noise inside my refrigerator and it looked like something on fire when I opened the freezer door. What should I do? There are defrost heaters imbedded in the evaporator coil in your refrigerator to defrost the coil after an accumulated period of running time of the compressor. You were probably seeing and hearing the refrigerator in a defrost cycle. 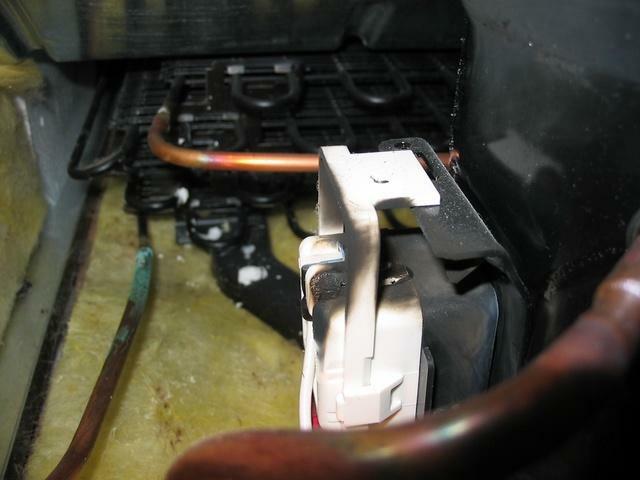 Since you unplugged the refrigerator, the coil is now defrosted and if you plug it back in, you will not hear this sound. In fact, the refrigerator will not run because it is probably still in defrost. 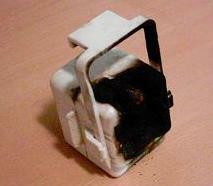 So plug it back in, let it sit until it starts running and cooling. I have made many service calls for this identical situation. Don't be afraid to plug it back in. Turn it off at control, plug in, and turn control back on. If there is something actually wrong, you can unplug it again. Three of the most common fridge noise makers are the evaporator fan motor, condenser fan motor and the defrost timer. The evaporator fan motor is in the freezer section. Often when the freezer door is opened, the noise will get louder. The condenser fan motor is at the back bottom of the fridge. The defrost timer can be found in several different spots, at the back of the fridge, inside the fridge or under at the front are some common areas to find the defrost timer. 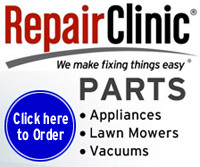 Do not attempt to oil any of these parts, replacing them is the best repair. Freezing purchased frozen foods: Keep them in their original containers. Such foods include TV dinners, fish, bulk vegetables, pies, cakes, pastries, berries, etc. Freezing meats, fish & poultry: Wrap well in freezer weight foil, forming it carefully to the shape of the meat. Fold and crimp the ends of the package to provide a good lasting seal. Never ever re-use thawed, uncooked meat: Meat may be frozen successfully only one time when raw, and only one time after cooking. Freezing home-cooked foods: Keep these in containers of wax-coated cardboard, aluminum foil or plastic. Foods cooked in pyrex ware or corning ware can be stored right in those dishes with tight fitting covers. Freezing fresh foods & vegetable: Select only high quality produce. The condition before freezing will determine it's quality when served. Prepare foods quickly and carefully, avoid excessive handling. Pack the food in odorless, moisture-proof containers to prevent it from drying out and absorbing other odors. Freeze immediately after packing. Thawed foods should be used as quickly as possible. 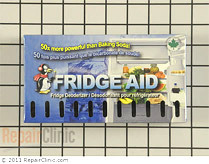 Freezer section- Suggested freezer storage times for other food items: Most fruits & vegetable - 8 to 12 months. Lean fish - 6 to 8 months. Fatty fish, breads, rolls, soups, stews, casseroles 2 to 3 months. Cakes, pies, sandwiches, leftovers ( cooked ) - 1 month. Ice cream ( original carton ) - 1 month maximum.